But I found out that I have an ally in the Camp Wars. (The DH and DS LOVE camping....) My basset/beagle, Darlington, is just as much of a princess. 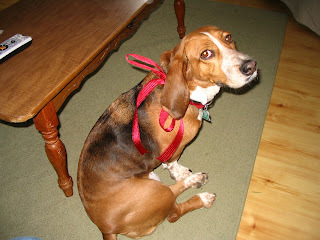 (And yes, I'm the masochist who put the bow on her at Christmas. I think she wanted to bite my leg off for it.) Her idea of camping is barking at anyone who goes past the campsite. She'd prefer to park her doggy self on the couch in the TT and sleep. Are we spoiled? Maybe. The whole point of camping is to commune with the outdoors. I'm just prefer my outdoors to be behind glass or at least a screen. So the next time we go camping, I will bring the computer and you'll most likely find Darlington and me in the TT.